The Curta was conceived by Curt Herzstark (1902–1988) in the 1930s in Vienna, Austria. By 1938, he had filed a key patent, covering his complemented stepped drum, Deutsches Reichspatent (German Empire Patent) No. 747073. This single drum replaced the multiple drums, typically around 10 or so, of contemporary calculators, and it enabled not only addition, but subtraction through nines complement math, essentially subtracting by adding. The nines' complement math breakthrough eliminated the significant mechanical complexity created when "borrowing" during subtraction. 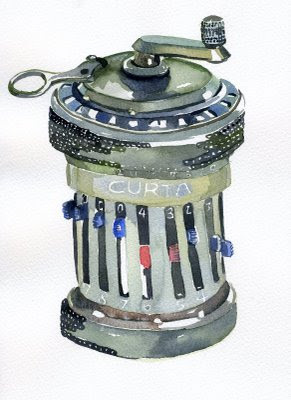 This drum would prove to be the key to the small, hand-held mechanical calculator the Curta would become. His work on the pocket calculator stopped in 1938 when the Nazis forced him and his company to concentrate on manufacturing measuring instruments and distance gauges for the German army. Herzstark, the son of a Catholic mother but Jewish father, was taken into custody in 1943, eventually finding himself at the Buchenwald concentration camp. Ironically, it was in the concentration camp that he was encouraged to continue his earlier research: "While I was imprisoned inside [Buchenwald] I had, after a few days, told the [people] in the work production scheduling department of my ideas. The head of the department, Mr. Munich said, 'See, Herzstark, I understand you've been working on a new thing, a small calculating machine. Do you know, I can give you a tip. We will allow you to make and draw everything. If it is really worth something, then we will give it to the Führer as a present after we win the war. Then, surely, you will be made an Aryan.' For me, that was the first time I thought to myself, my God, if you do this, you can extend your life. And then and there I started to draw the CURTA, the way I had imagined it." Herzstark worked hard to move his invention from his knowing how to build the device "in principle" to concise working drawings for a manufacturable device. The department head's celebration plan did not materialize, but Herzstark's construction plans did. Between April 11, 1945, when Buchenwald was liberated by the Americans, and the following November, Herzstark was, after making only a few "detailed improvements" to the design, able to locate a factory in Sommertal, near Weimar, where machinists were skilled enough to work at the necessary level of precision, and walk away with three working models of the calculator. The Russians had arrived in July, and Herzstark feared being sent to Russia, so, later that same month, he fled to Austria. He began to look for financial backers, at the same time filing continuing patents as well as several additional patents to protect his work. The Prince of Liechtenstein eventually showed interest in the manufacture of the device, and soon a newly-formed company, Contina AG Mauren, (aka Contina Ltd Mauren) began production in Liechtenstein. It was not long before the financial backers, apparently having gotten from him all they thought they needed, contrived to force him out by reducing the value of all existing stock to zero, including his one-third interest in the company. These were the same people who, earlier, had elected not to transfer ownership of the Herzstark's patents to the company, so that, should anyone sue, they would be suing Herzstark, not the company, thereby protecting themselves at Herzstark's expense. This ploy now backfired: without the patent rights, they could manufacture nothing. Herzstark was able to negotiate a new agreement, and money continued to flow to him. Curtas were considered the best portable calculators available until they were displaced by electronic calculators in the 1970s. Herzstark continued to make money from his invention until that time, although, like many inventors before him, he was not among those who profited the most from his invention. The Curta, however, lives on, being a highly-popular collectible, with thousands of machines working just as smoothly as they did 40, 50, and 60 years ago when they were manufactured. Seeing as the patents for this magnificent toy is already expired, won't somebody start manufacturing these wonderful mechanical calculators so that we can experience some real non-digital works-of-genius? More wonderful reading on this mechanical masterpiece can be found at DarkRoastedBlend.com's write-up on the Curta, Clive Maxfield's piece at EETimes.com and Wobbe Vegter's piece on Cyberheroes of the past. Thanks to IPEXL for the information. In addition, Herzstark had also filed a few patents in the US. I think that electronic calculators would be cheaper to produce. Pouchee has an online store at Shopify. The business was founded when the founder could not find an organizer that suited her needs. She then designed her own and contracted a manufacturer in China to mass produce the initial batch of organizers. The founder wisely decided to register the patent for the product before marketing it. The product was successful and spawned knockoffs.